The Prophet (PBUH) has declared the importance of learning the Qur’an with the above-mentioned hadith and others. Learning the Qur’an should be part of every Muslim’s life. By learning the Qur’an, our minds are enlightened and our Iman (faith) becomes stronger. At the Islamic Center of Naples, we are offering Qur’an classes for adults and children. The classes are lead by our Imam Muhammad Nour. There are four groups of adults classes. The beginner group is on Mondays from 7.30pm to 8.30pm and Wednesdays between Maghreb and Ishaa. This group will learn the basic Arabic letter and pronunciation from book Qaida Noorania. Inshallah. The Juz ‘Amma memorization group is on Tuesdays from 7.30pm to 8.30pm and Thursdays between Maghreb and Ishaa. Inshallah. 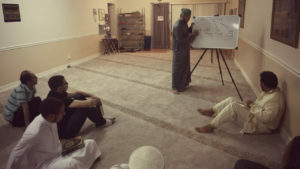 The Qur’an memorization group is on Tuesdays and Fridays between Maghreb and Ishaa. Inshallah. Sisters class is on every Monday between Maghreb and Ishaa. Inshallah. All the adult’s classes are held at the Islamic Center of Naples on the days mentioned. If you would like to join the class, please contact the Imam. The children Quran classes are held at the Islamic Center of Naples on Sundays between 11:00 am and 1:00 pm. The first day of class this year is Sunday, August 12th, 2018. Please plan to arrive around 10:45 am. We request from parents to attend the first class along with their children in possible. If you would like your child to join the class, please use the form below to send an email with your child’s name and age. If you were registered last year, you don’t need to renew and we will contact you to let you know which class your kids will be placed in based on Imam Nour’s recommendation. If you are new to our kids Quran classes please use the form below to register your kids. We need new registration sign by Friday, July 27th, 2018.